Wasps Blue claimed the Junior Alliance League Under 13 Division One title in fine style on Sunday. They beat Deeping Blue 12-0 to clinch the crown with one more game to go. Taylor Horne led the rout with four goals and there was a hat-trick for Nasir Nabi. Completing the haul were Connor Bell (2), Louie Venni, Jay Ward and Kyle Ginns. In the Under 13 9v9 Division, Northern Star’s championship hopes received a massive boost. While they were busy making it a sweet 16 wins out of 16 games with a 2-0 success over March Soccer School, closest challengers Netherton were being hammered 6-2 at Thurlby. Phillip Creasey and Nathan Rudman were the boys on target for Star, while Thurlby’s scorers were Rhys Ellis (2), Jacob Westley (3) and Jacob Miller. Deeping Under 14s are another side who look set to complete their league season unbeaten. 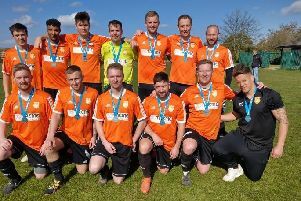 The Division One champions beat Ketton 10-0 in their penultimate fixture with substitute Alfie Ferguson striking five goals and Nathan Pickering claiming four. The biggest win at the weekend came from Thorpe Wood Rangers Blue in Under 14 Division Three. They trounced Colsterworth 17-0 with Ethan Bennett bagging four and Ethan O’Hanlon and Tyler Rooke hitting hat-tricks. With one game to go they are neck and neck at the top with Wisbech St Mary. Riverside hold a 2-1 advantage over Hampton after the first leg of the Under 12 Division Two title play-off . Kyall Woods scored twice for Riverside with Spencer Ingram replying for Hampton.